We report a case of trigeminal neuralgia successfully treated with neural prolotherapy. The patient is a 70-year-old man with a 15-year history of trigeminal neuralgia refractory to pharmacologic treatment. After one treatment of neural prolotherapy the patient reported 5 months of complete resolution of his symptoms. A second treatment was performed affording him another 10 months of relief. 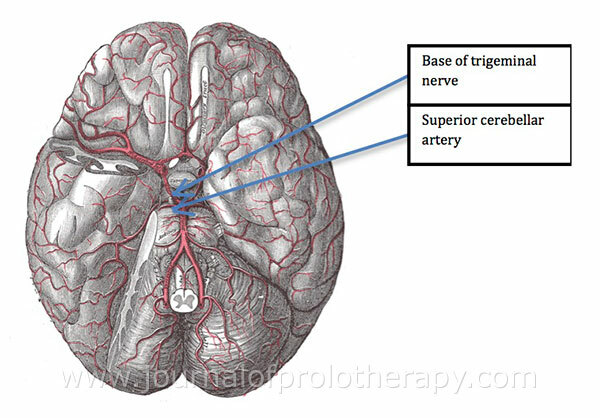 Neural prolotherapy may have an important role in treating trigeminal neuralgia. It can be a safe and effective treatment for those experiencing side effects from medications, contraindications to surgery, or less than favorable improvement from traditional treatments. The trigeminal nerve is the largest cranial nerve. It primarily supplies sensory information to the face and motor control to the muscles of mastication. The nerve forms the semilunar ganglion in a cavity of the dura mater near the apex of the petrous part of the temporal bone. 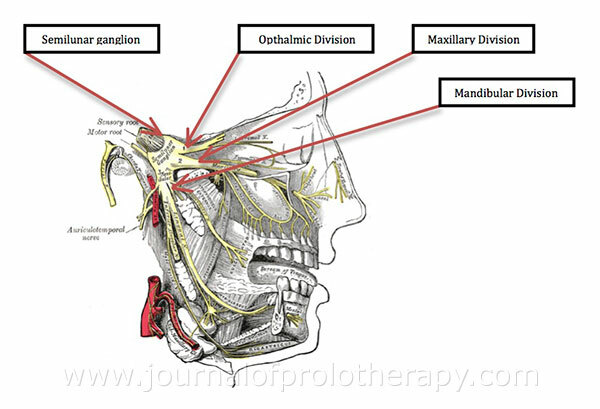 The nerve then divides into three major components named the ophthalmic, maxillary, and mandibular divisions. The ophthalmic division supplies sensory information to the mucous membrane of the nasal cavity, skin of the eyelids, eyebrow, forehead and nose. The maxillary division supplies the mid-face, maxillary teeth, lower eyelid and upper lip. The mandibular division supplies the teeth and gums of the mandible, the skin of the temporal region, the skin of the outer ear, lower lip, lower part of the face, mucous membrane of the anterior two thirds of the tongue, and the muscles of mastication. Trigeminal Neuralgia is characterized by several symptoms. The condition is severely painful. 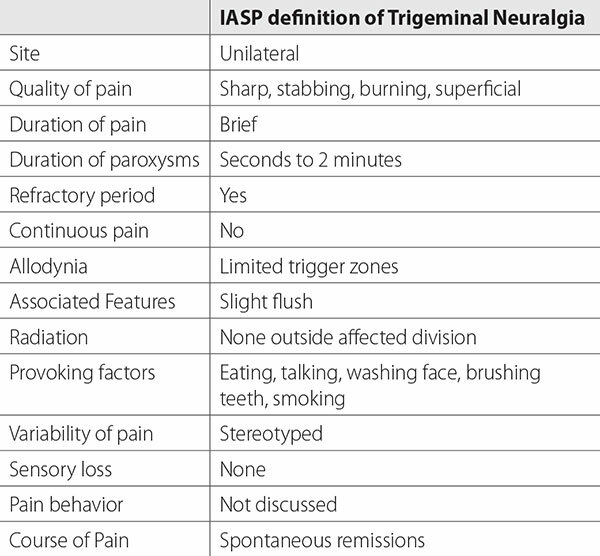 The IASP (International Association for the Study of Pain) defines trigeminal neuralgia utilizing the characteristics seen in Table 1. Patients typically complain of unilateral, sharp, stabbing, burning, superficial pain. The pain is brief lasting seconds to 2 minutes. Allodynia and trigger zones may be seen. Behaviors such as eating talking, washing the face, brushing teeth and smoking may provoke symptoms. Interestingly, sensation to the face typically remains intact. A 70-year-old male presented to our PM&R clinic referred by his allergist for evaluation and treatment of trigeminal neuralgia. The patient was first seen in our clinic in January 2012. He reported a history of facial bone fractures in 1983 with no subsequent symptoms of trigeminal neuralgia. He reported having root canals complicated by infections several years prior to the onset of trigeminal neuralgia. His diagnosis of trigeminal neuralgia was made by a neurologist prior to being seen in our clinic. At the time of his initial visit, the patient was being treated with carbamazepine and lamictal. The patient complained of severe, sharp, stabbing pains on the right side of his face involving the mandibular, maxillary and ophthalmic branches of the trigeminal nerve. He also noted severe pain when trying to brush his teeth. Examination showed no focal neurologic deficits. There were dysesthesias and allodynia along the maxillary and ophthalmic branches of the trigeminal nerve. Throughout the visit the patient did have a characteristic “tic” every 1-2 minutes due to the lancinating pain of trigeminal neuralgia. We elected to proceed with a neural prolotherapy treatment. Prior to the procedure the patient was given a cotton swab to rub against his gums and teeth to reproduce some of his pain and sensitivity. This was done to obtain a baseline of his pain prior to the procedure. The patient was then placed in the left lateral decubitus position and the right side of the face was treated utilizing a neural prolotherapy technique. Approximately 15 injections were provided to the distribution of the 3 involved branches of the trigeminal nerve. A 27 gauge ½ inch needle was used to inject a 5% dextrose solution into the subcutaneous tissues. Approximately 1-2cc was injected in each area. After the procedure, the patient was instructed to utilize the cotton swab to try and reproduce his symptoms. The patient was unable to reproduce any of the pain and sensitivity that was present prior to the procedure. The patient was observed in the clinic for 15 minutes and had no “tics” from trigeminal neuralgia. The patient was instructed to follow up in 1 week however the patient did not return until 6 months later. At this visit, the patient reported that the neural prolotherapy treatment provided him with 5 months of complete resolution of his symptoms. He stated that his symptoms only returned after hitting his head when exiting his car. His complaints at this time involved severe, sharp stabbing pain in the right forehead, right eyeball, periorbital region and right temple. He complained of pain when getting a haircut, he found that just simply touching his hair and scalp caused him severe pain. The patient was given a second treatment of neural prolotherapy along the course of the trigeminal nerve. The same technique as the first treatment was utilized. The patient again noted immediate complete resolution of his pain. The patient was again instructed to follow up in 1 week however the patient did not return until 10 months later. At this visit the patient reported relief of his symptoms during the 10 month time period. Unfortunately, at this visit he returned due to another head injury that aggravated his symptoms. This head injury was more concerning than in the past and the patient had suffered a concussion. The treatment was modified at this point and the patient received an ultrasound guided occipital nerve block. The relief was short lived however, lasting only a couple of days. The patient had resumed follow up with his neurologist who referred him to a neurosurgeon. Once evaluated by the neurosurgeon it was decided that microvascular decompression of the trigeminal nerve be performed. After this procedure, the patient noted complete resolution of his trigeminal neuralgia. I was able to see the patient at the time of writing this case report, about 2 years post-op, and he was able to confirm that he has not had any recurrence of symptoms to date. Another study, by Simone et al., found that intradermal injections of capsaicin in humans resulted in primary hyperalgesia to heat and mechanical stimuli.10 This study shows a direct connection between capsaicin TRPV1 agonism and hyperalgesia. 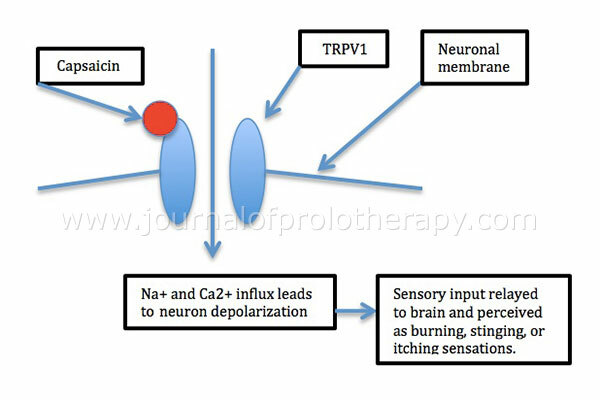 This suggests that antagonism of TRPV1 with neural prolotherapy may reduce symptoms of hyperalgesia and/or nociception. 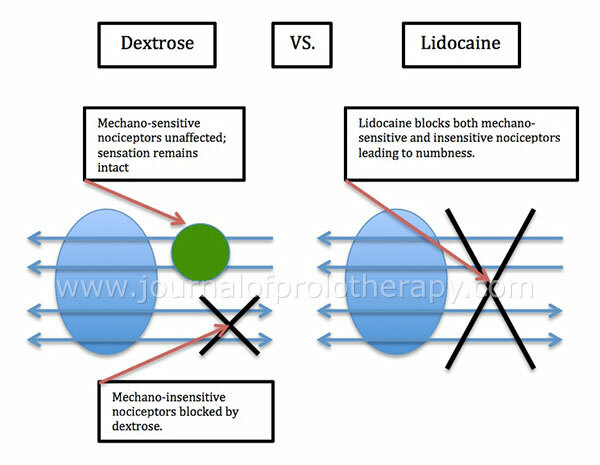 The proposed theory also states that dextrose may down regulate TRPV1 receptors. Neural Prolotherapy is hypothesized to be effective for treating neurogenic inflammation. It is also thought to be effective in relieving the constriction of nerves at CCIs. Its effects seem to be appreciated quite rapidly. In the case above immediate resolution of neurogenic pain was seen after each treatment. reduce or eliminate the need for medications. Further, some patients may wish to avoid surgery and pursue less invasive treatment. Other patients may be high-risk surgical candidates or have contraindications to surgery. For those with some of the above described issues, neural prolotherapy may prove to be a safe and effective treatment option for trigeminal neuralgia. 2 Geppetti P, et al. The concept of neurogenic inflammation. BJU. 3 Weglein AD. 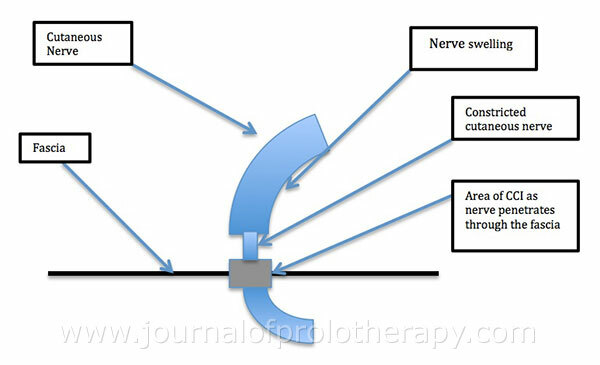 Neural Prolotherapy. Journal of Prolotherapy. 2001;3(2):639-643. 4 Conaway E, Browning B. Neural Prolotherapy for Neuralgia. 2011, December. Retrieved February 23, 2016, from http://journalofprolotherapy.com/index.php/neuralprolotherapy-neuralgia/. 5 Gray H. (1918). The Trigeminal Nerve. Retrieved March 13, 2016, from http://www.bartleby.com/107/200.html. 6 Singh MK. Trigeminal Neuralgia. 2015, October 22. 7 Gray, Henry. 1918. Anatomy of the Human Body. Fig. 516. (n.d.). Retrieved March 14, 2016, from http://www.bartleby.com/107/illus516.html. 9 Murata Y, Masuko S. Peripheral and central distribution of TRPV1, substance P and CGRP of rat corneal neurons. Brain Res. 2006;1085:87–94. doi: 10.1016/j.brainres.2006.02.035. 10 Simone DA, Ngeow JYF, Putterman GJ, LaMotte RH. Hyperalgesia to heat after intradermal injection of capsaicin. Brain Res. 1987;418:201-203. 11 Jancsó N, Jancsó-Gábor A, Szolcsányi J. Direct evidence for neurogenic inflammation and its prevention by denervation and by pretreatment with capsaicin. British Journal of Pharmacology and Chemotherapy. 1967;31(1):138-151. 12 Anand P, Bley K. Topical Capsaicin For Pain Management. Br J Anaesth. 2011;107(4):490-502. 13 Greenberg M. How Does Perineural Injection Therapy (PIT) Work? 2014, January. Retrieved March 13, 2016, from http://apcpain.net/dr-greenbergs-blog/regenerative-treatment/howdoes-perineural-injection-therapy-pit-work/. 14 Meng J, Ovsepian SV, Wang J, Pickering M, Sasse A, Aoki KR, Dolly JO. Activation of TRPV1 mediates calcitonin gene-related peptide release, which excites trigeminal sensory neurons and is attenuated by a retargeted botulinum toxin with anti-nociceptive potential. The Journal of Neuroscience. 2009;29(15):4981-4992. 15 Nurmikko TJ, Eldridge PR.Trigeminal neuralgia—pathophysiology, diagnosis and current treatment. Br. J. Anaesth. 2001;87(1):117-132 doi:10.1093/bja/87.1.117. 16 Hauser R. Article and updates for general readership on Trigeminal Neuralgia treatment.